A spoon made of environmentally friendly plastic? It works. Anyone can do normal plastic. That's why we have taken a whole new direction with our dosage spoon. We insist on organic plastic made of corn and potato starch. It is as durable and hygienic as regular plastic, but much better for the environment. Use it to measure out the perfect amount of powder for a shake quicker than you can say squat: Whey, Shape Shake, 3K, Organic, Vegan, all of the above! The only thing we can't help with is the workout itself. Plastic from the field. Good for nature. It looks like plastic. It is as durable as plastic. It can be washed as easily as plastic. But when it comes to the environment, our spoon raises the bar to all new heights: We only use organic plastic made of plant fibres, corn and potato starches. It has all the advantages of normal plastic, but is biodegradable and completely free from harmful plasticisers. The right measurement is important to ensure the muscles can get the maximum amount of power from the protein. When you take in a lot of protein, you should also drink the right amount of water. Your kidneys will thank you. That's why we recommend not using more than 30 g of powder per shake. The best way to measure this out is by using the dosage spoon, of course. Just the right amount in an instant. The right measurement is important to ensure the muscles can get the maximum amount of power from the protein. When you take in a lot of protein, you should also drink the right amount of water. Your kidneys will thank you. That's why we recommend not using more than 30 g of powder per shake. The easiest way to get it right is with our dosage spoon. Just the right amount in an instant. The dosage spoon for all foodspring protein. Our dosage spoon measures out exactly 30 g of protein. This is the perfect measurement for your favourite protein shake: Whey protein, Shape Shake, 3K, organic or vegan. Simply scoop the protein up with the spoon, scrape off the excess and put it in the shaker. Is the dosage spoon also suitable for Amino Shakes? No. Our 30 g dosage spoon ensures the perfect amount of powder for every type of Whey Protein, Shape Shake, 3K, organic and vegan. We do however recommend that you only use 20 g of powder for our Energy Aminos as well as Recovery Aminos. That's why both Amino Shakes come with their very own corresponding dosage spoon. Organic plastic? Does that really exist? We couldn't believe it either. That's why we searched long and hard. What we discovered blew us away: Organic plastic made of plant fibres, corn and potato starches. Our spoon is also just as hygienic, easy to clean and as durable as normal plastic. But it can also – when needed – be discarded in an environmentally friendly way. This is simply down to it being biodegradable. 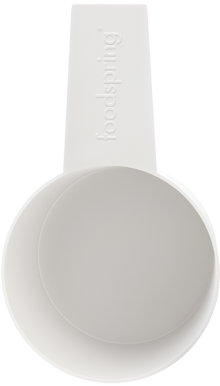 foodspring Dosage Spoon will be back in stock shortly.